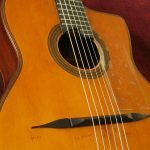 This is the first of a few posts about the things (most of which are instruments) which have influenced my work. 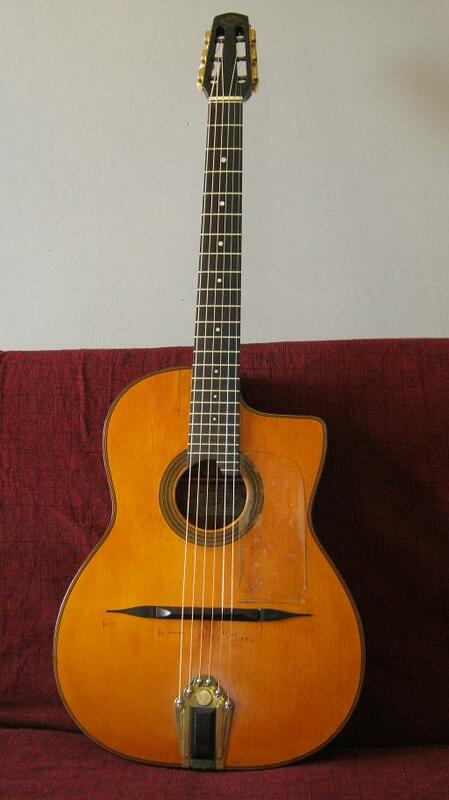 This fine old guitar was the property of my late Grandfather, Charlie Ferguson. Charlie was a well respected player in the Tyne Valley and played in bands for sixty years. 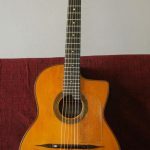 For gigs he played electric guitars – he was always buying and selling, but this was the guitar he loved the most and the one he used to take down to the Accordion Club which was held once a month at the Ex-Service Mens Club in Hexham, Northumberland. He played what he called “Dance band style” guitar, which is the lovely bass note and chord style of players like Eddie Lang. The closest player I have heard to Charlie was the late Perrie Willie Johnson, the wonderful folk/jazz player from Shetland. 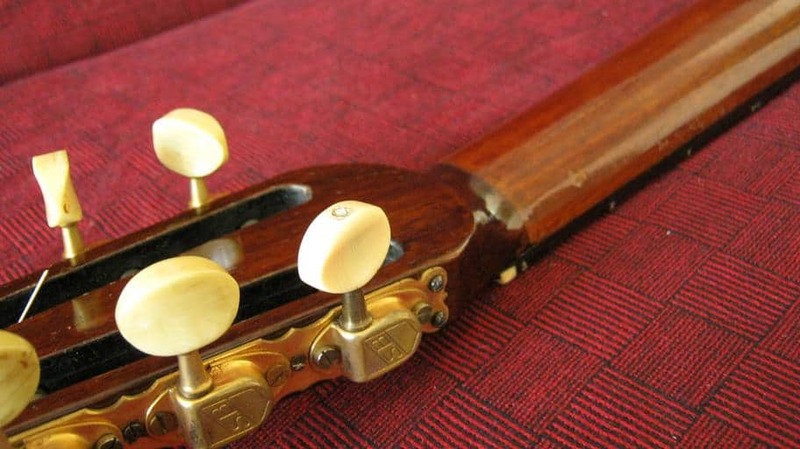 The guitar seems to be a mixture of parts which is not uncommon. 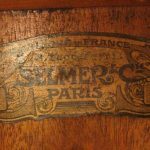 When Selmer decided to get out of the guitar business, many instruments were made up from parts which were around. 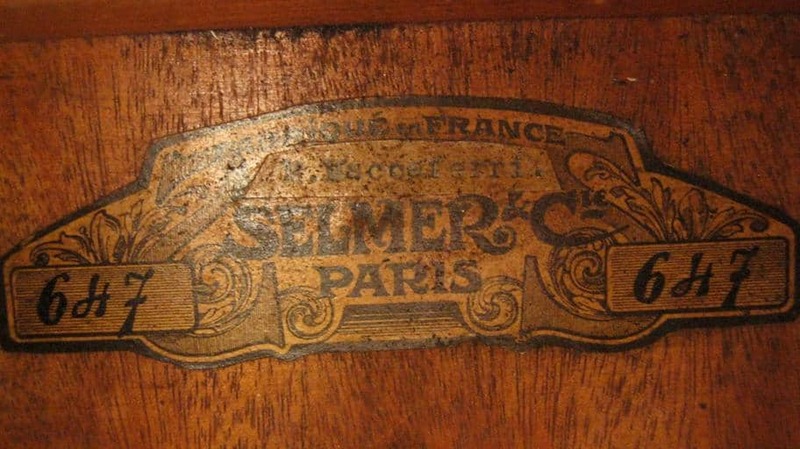 The body is narrow suggesting it is from a tenor guitar- I believe Selmer made these quite early on, whilst the soundboard has a rare round hole, which may date from their “middle” period – after Selmer and Maccaferri parted company. The Label says 647 which is a little later but bears the name of Maccaferri on it. Also it seems the cutaway has been put in afterwards, and very skillfully. 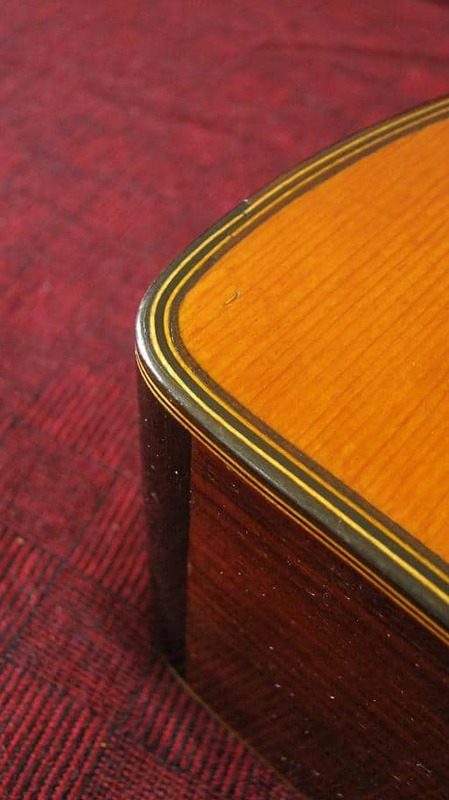 You can see the staggered joins in the purfling if you look carefully and the “nose” of the cutaway is a vertical Ebony fillet. My guess is the side was actually cut and re bent to fit the cutaway shape. Skilled work indeed. 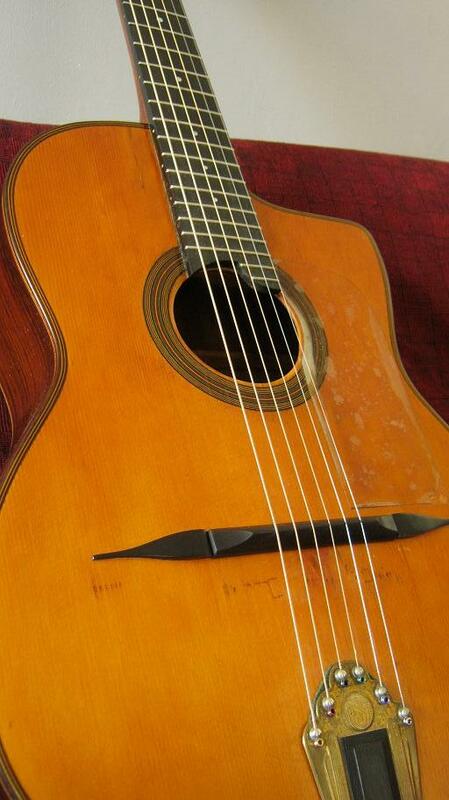 According to the excellent book on these guitars by F. Charle, a chap in London (Rocca?) was known for doing this sort of work. I used to have a copy of the book but I loaned it out and never saw it again so my knowledge is a little sketchy. If any of you know better please let me know and I’ll correct this post. The way in which this guitar has been a reference point to me over the years are many. Aesthetics is a personal thing but I believe some makers just have a good eye, whilst others do not. Maccaferri had a good eye. Whilst I do like other cutaway shapes, to me this is the most dignified, and is undeniably European. I believe his teacher used a similar one. The decoration is so delicate and understated, with shallow binding and simple purflings – something I try to do also. The neck/head joint is a cracking piece of wood machining, and something I used to emulate when I started as the timber stock I had was too short to joint the heads in the conventional manner. But the most impressive thing about this little guitar is the sound. Instant Django! I have tried many modern copies but nothing comes close. The guitar is extremely loud, and lends itself to percussive playing. 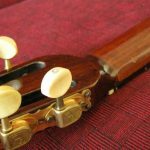 The tone is what one would expect – the tone is thick with not so much sustain but with considerable resonance. Perfect for the style of music it was used for. 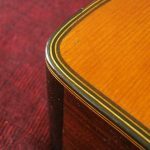 It is a wonderful piece of craftsmanship, made by men who were skilled cabinetmakers, not trained luthiers, yet despite this it was decades before there were any steel string guitars being made in Europe that could come close.